Any time of year is the right time for love and romance, but there are times of year and settings with special meaning that add an extra dimension to a story. Romantic walks holding hands with your sweetheart, kicking up the multi-colored autumn leaves is another favorite. And there is nothing like a spring wedding, the time of year when the world wakes up from winter, when flowers and new leaves appear, when a bride and groom can stand among the daffodils in the churchyard to have their photo taken. I love all of the above, but for me the most romantic time of year is the Christmas holiday season. This is the time of year when love and goodwill seem to overflow and romance is in the air, a time for both lovers and families to enjoy, a time of year with so many opportunities for romantic fun. There are endless scenarios for romantic scenes, buying Christmas trees, taking the children to visit Santa Clause, happy couples frolicking in the snow, kissing under the mistletoe, or cuddling together on the sofa in front of a roaring log fire, families gathered together around the Christmas tree unwrapping gifts. I admit it—I have written them all. Christmas is the ideal time for heroes to show their mettle, to demonstrate they are kind, loving men, worthy of their heroines, men who value and protect their children. Nothing beats a winter wedding, with the bride in a fur shrug, the groom in morning dress, and a nativity scene in the back of the medieval English country church. Maybe I live in the past, or an old-fashioned fantasy world, but this sweet, heartwarming type of story is what I love to read and write. What time of year do you think is the most romantic? Helen Scott Taylor won the American Title IV contest in 2008. Her winning book, The Magic Knot, was published in 2009 to critical acclaim, received a starred review from Booklist, and was a Booklist top ten romance for 2009. Since then, she has published other novels, novellas, and short stories in both the UK and USA. Helen lives in South West England near Plymouth in Devon between the windswept expanse of Dartmoor and the rocky Atlantic coast. As well as her wonderful, long-suffering husband, she shares her home with a westie a Shih Tzu and a burmilla cat. She believes that deep within everyone, there’s a little magic. Find Helen on FaceBook and Twitter, or visit her website. Helen's latest releases are all Christmas books! For a boxed set of three heartwarming novellas full of children, cute pets and snow try Merry Christmas Romance. 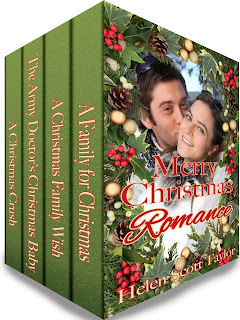 If you enjoy military or medical heroes, The Army Doctor's Christmas Collection boxed set is for you. Both are Kindle ebooks. For those who have Nooks, A Family for Christmas is a bestselling Christmas ebook on Barnes and Noble. I've got to admit, I find Christmas romances irresistible. Give me a romantic scene by a warm fire, and I want to jump right into the pages! Agree, there is something about Christmas! I live downunder so the idea of a winter Christmas appeals so much - not that I'm complaining about a summer Christmas, but fires and snow and snuggling up.... very romantic. I love Christmas stories, especially romances. Just looking at your cover makes me feel in the Christmas spirit. Since I live in warm climates now, Christmas also includes palm trees decorated with multicolored lights, Santa balloons on the sand, and a Christmas Day in shorts and bathing suit on the beach. Yes, Christmas festivities can come in different pictures, but it's the smiles on happy faces that reveals people are in a celebration mood. I have to admit the idea of Christmas on the beach does hold strong appeal, especially today, when I have just taken the dog for a walk in the chilly wind. I can't imagine Christmas in the sun, though. One day I'll have to try it! I love Christmas romance stories! It's the season for love and family. To ne it is Christmas and holiday stories. Loved reading your post! We were in England and Ireland for three weeks this spring and we are going to Scotland next spring, I love your part of the world! You have sure gotten me in the mood for Christmas, and now I am off to buy your books online! The most romantic season ... hmm ... that would have to be, no matter what time of year, that moment when your and your loved one's eyes meet and you know you are one. Could be the two of you alone on a beach, or across a room crowded with family and friends come to celebrate the holiday with you.